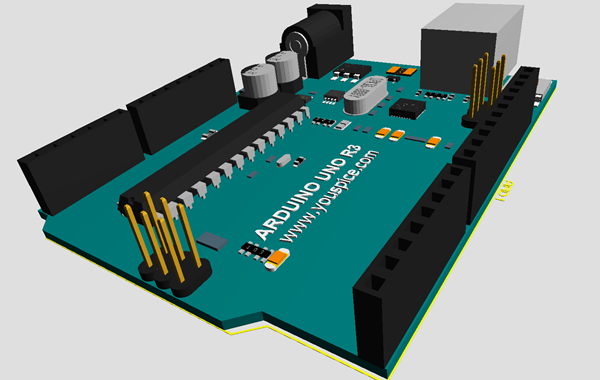 Arduino is an hardware/software open-source microcontroller board. It has been widely accepted in the hobbistic, educational and professional communities due to its versatility, ease of use and programming. This tutorial explains step by step how to simulate, visualize the layouts and 3D models of ARDUINO UNO, ARDUINO MEGA, and ARDUINO Pro mini boards in Proteus. This article is free, login to read it. Posted in Proteus and tagged 3d Models, ARDUINO libraries, ARDUINO MEGA, ARDUINO Pro Mini, ARDUINO simulation, ARDUINO SPICE simulation, ARDUINO UNO.